This large and well signposted path follows the front line between the Italian and the Austrian soldiers during World War 1 on Mount Lagazuoi. This trail is very easy and suitable for everybody. Next to the parking area of the Lagazuoi cable car at the Falzarego Pass (2107 mt) begins the wide and well-marked hiking trail number 402. which leads you up to the Forcella Travenanzes (2507 mt) without any difficulties. There you turn left onto path no. 401 and reach the saddle Forcella Lagazuoi. Proceeding on this path you reach the Lagazuoi refuge (which is very close to the top station of the cable car) and from the hut it is only a short walk to the summit cross of the Little Lagazuoi in 2778 m height. 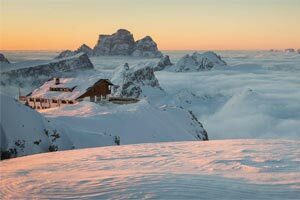 From here you will enjoy unobstructed panoramic views of famous Dolomite peaks such as Pelmo, Antelao, Tofane, Marmolada, Piz Boe, Civetta and the Sella massiv. You can return to Falzarego pass the same way (and double the walking tome) or with the cable car in a few minutes. The Lagazuoi is a mountain without barriers: the cable car, the exhibit space Lagazuoi EXPO Dolomiti, the Lagazuoi refuge and even the path leading up to the summit cross are accessible to everyone, even with pushchairs and wheelchairs!